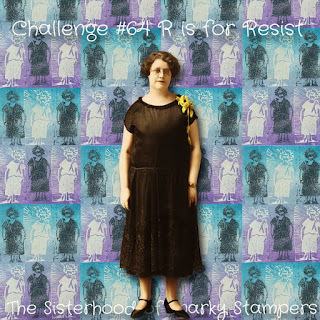 Challenge # 64 "R - Resist Technique"
Today I have my last post for the Sisterhood of Snarky Sisters. and coloring only the raised portion of my image. I used gelato's to color this butterfly by dragging my sticks of gelato lightly on top of my raised image and resisting the de-bossed image. Then I lightly sprayed my image to activate the water colors of my gelato's. I backed up my card on some lovely Graphic45 papers and added the SHINE letters to the top. 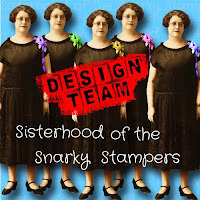 Check out my Sisters at the Sisterhood of Snarky Stampers blog. I have neglected my gelatos for a long time... this technique may just inspire me to get them out again! Beautiful card. Great idea for resist. The card is gorgeous. Yet another cool idea for the resist technique! Your card is beautiful! Gorgeous!! Love the butterfly! Awesome take on the challenge sistah! Your butterfly is gorgeous! Thank you for sharing the technique you used - I must try it out.